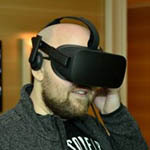 In advance of the launch of AMD’s next-generation Radeons, NVIDIA has decided to give gamers another compelling reason to consider GeForce. 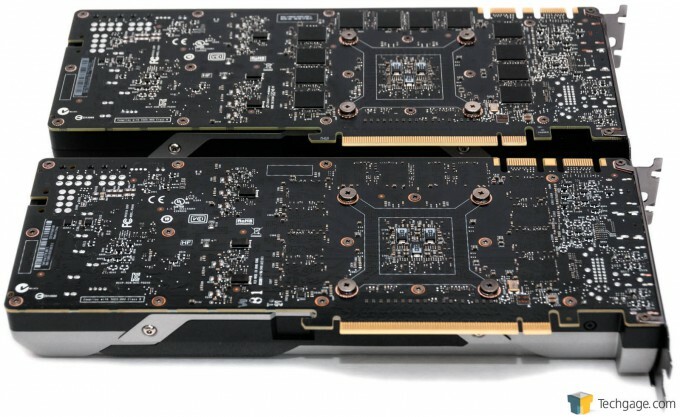 Its latest card is called the GTX 980 Ti, and its performance comes a lot closer to TITAN X than GTX 980. It sports 6GB of VRAM, costs $649, and could make AMD’s job a lot harder. 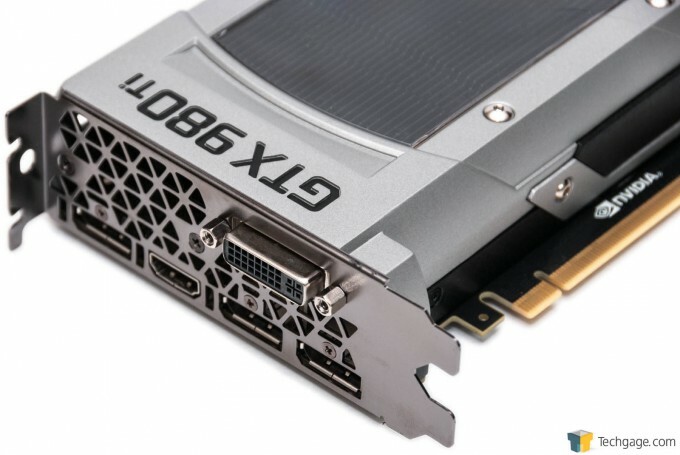 With AMD rumored to launch its next-generation GPUs soon, I suppose there’s no better time than the present for NVIDIA to strike with a card that could act as a swift kick to the red team’s chest. 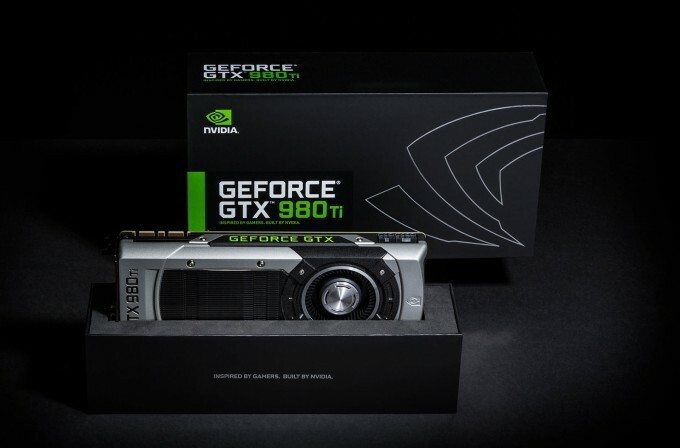 NVIDIA’s latest is called the GeForce GTX 980 Ti; it slots just under the TITAN X, and costs $649. Based on what we knew last week, I had taken a guess that the 980 Ti would be priced at $749. Now that I’ve put the card through its paces, I still would have guessed $749 if I wasn’t told different. With its 980 Ti, NVIDIA really wants to make a statement. Considering this is just the start of the review, I am putting an awful lot of hints as to what I think of the card on the table, but believe me, it’s worth looking through all of the results. 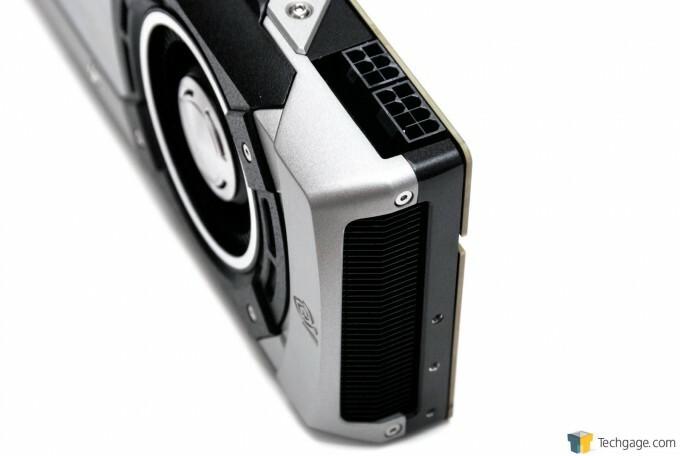 AMD side, the 980 Ti even harms the appeal of NVIDIA’s own $1,000 TITAN X to some degree. Again… this card is a statement. The TITAN X has close to 10% more cores than the GTX 980 Ti, but as we’ll see throughout the performance results, that doesn’t make it 10% faster. Both cards share a lot of the same specs, but even then, that 10% core boost doesn’t do a whole lot. What sets TITAN X apart, then, is its mammoth 12GB framebuffer, and tying into that, one thing that sets the 980 Ti apart from the non-Ti is a 50% VRAM boost. I feel very confident in saying that unless you’re running triple 4K monitors, 6GB of VRAM is going to prove sufficient for a while. With a 6GB framebuffer, it’s inevitable that people are going to question whether or not the final 500MB is crippled. In talking to NVIDIA, I was told that no… it’s a solid 6GB partition. That being the case, it’s hard to not imagine that at the root, this card is just a TITAN X with some tweaks made. Does that mean that the extra cores could be unlocked through a BIOS flash? I’m not sure, but it wouldn’t surprise me. On the topic of performance, NVIDIA considers its 980 Ti to be a direct follow-up to the 780 Ti, which was a follow-up to the GTX 680. 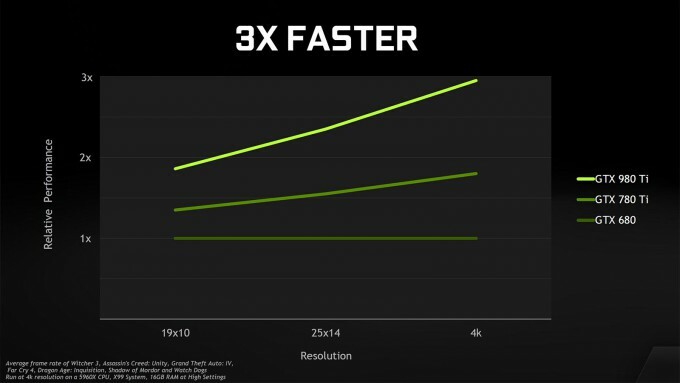 As seen below, NVIDIA says that the 980 Ti is almost 2x faster than the GTX 680 at 1080p, while it’s closer to 3x at 4K. 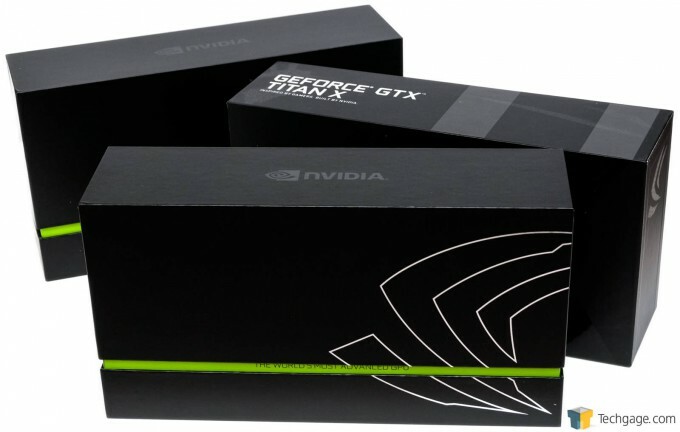 It might be hard to find in stores, but the official GTX 980 Ti packaging can be seen below. You’ll be able to score this if you purchase the card directly through NVIDIA, although I’m told that some Best Buy locations may have it as well. 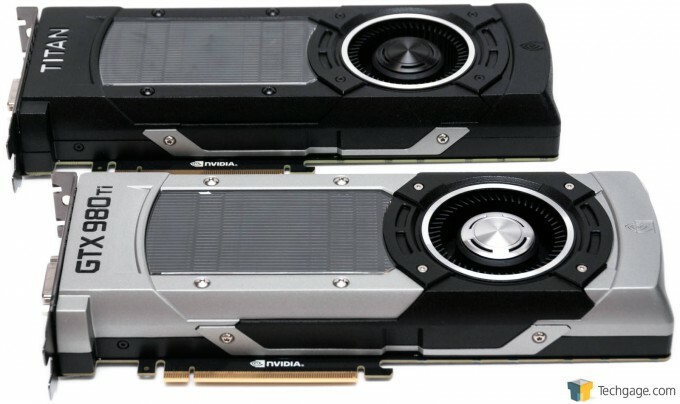 Here’s the latest card with its bigger brother, TITAN X. I’d assume that the GTX 980 Ti uses the exact same cooler as the GTX 980, unlike the TITAN X, which uses a vapor chamber cooler. Just a moment ago, I mentioned that the 980 Ti could use the exact same base as the TITAN X, and if the back of the cards are anything to go by, that really does seem to be the case. The only significant difference that I can spot is that the 980 Ti lacks the memory chips on the outside PCB – to be expected given the VRAM has been halved to 6GB. For ports, the 980 Ti includes a single DVI, single HDMI, and triple DisplayPort. Like its 250W big brother, TITAN X, the 980 Ti also requires both an 8-pin and 6-pin connector. There’s a lot more I could talk about here, but given a tight timeframe, I’ll have to save some for later. So without further ado, let’s tackle our testing methodology, and then dive right into performance results.